trailhead at Sierra del Norte and Hyde Park Road up and over the hills and down into Little Tesuque Creek represents a journey of great collaboration. On June 1, 2012 the day before National Trails Day, we gathered at the same trailhead to celebrate the official opening of this new trail; Dale Ball, the father of one of the city’s most beloved trail systems was on hand to help cut the ribbon. 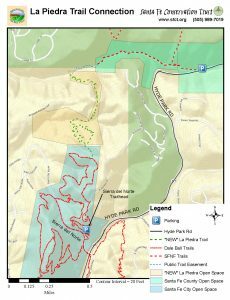 His actions came full circle on this day as our desire to link the city’s lower trails with the higher elevation trails in the national forest became reality. The completion of the trail connection and dedication of over 50 acres of associated open space is a real boon to the community. The success of this conservation project would never have been possible if it were not for the generosity of many community minded individuals coming together both privately and professionally for a common goal that was bigger than any of us; in this case the outcome was far greater than could have been achieved by individual action. Plus it can be a lot more fun working with one another! The La Piedra Trail now provides three miles of new recreational public trails connecting Dale Ball Trail North with the Little Tesuque Creek Trail. The trail allows trail users the opportunity to enjoy breath-taking views of the Tesuque Valley as well as shaded forests of piñon and ponderosa pines as the trail winds its way through diverse terrain and alongside cool, running creeks. 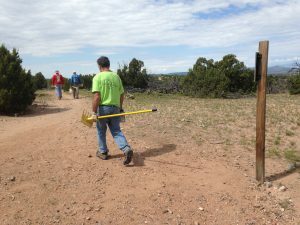 This link, connecting urban “wilderness” trails with the Santa Fe National Forest via Santa Fe County Open Space and the 13,000-foot high peaks of the Sangre de Cristo Mountains high above Santa Fe, enhances and expands the hiking, trail running and mountain biking experience for those who take to the trails each and every day; the La Piedra Trail promises to be one of the most important non-motorized trail connections in Santa Fe. Since the founding of our city over 400 years ago, trail access to the mountains – and nature – has been important to residents and visitors alike. However, with increased development on private land, the construction of paved roads and the continued practice of fencing lands, all of the major routes over natural surfaces have either been closed to the public or abandoned altogether. 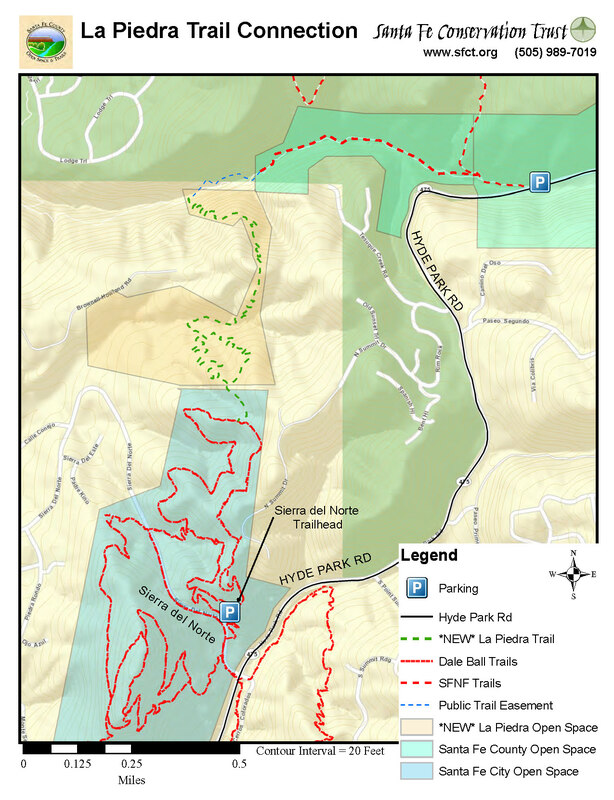 Our goal is to reestablish this lost connection by constructing a new trail link: connecting the city to the sky. The many public and private partnerships between the land trust, landowners and our public agency partners make this project unique; there is no other private entity like the Santa Fe Conservation Trust in Santa Fe working on important public trail issues of this magnitude.